Find us on Saltash waterfront, covering the stretch from Saltash Sailing Club through to Brunel Green. 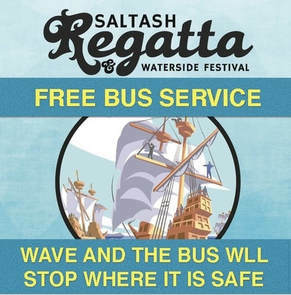 There are ample car parks in Saltash town, within walking distance of the waterfront, alternatively arrive by bus, train or hop on the free Regatta Hopper shuttle bus. Arrive directly into the heart of the Regatta by train from Devon, Cornwall and beyond. We are grateful to Great Western Railway for adding additional calls at Saltash over the Regatta weekend. Please make the most of them! The Regatta is just a few minutes walk from the station. For more information visit the Great Western Railway website. Three free community Hopper buses will be running along a variety of routes this Regatta weekend and can be flagged down.